SAP 2019-2018 was a memorable year for the SAP world. ERP (and hence SAP) began figuring prominently in conversations about digital, S/4HANA established its claim as the next-generation digital core, Leonardo developed further especially in Artificial Intelligence and Machine Learning, and the launch of C/4HANA signaled SAP’s aim to take on the CRM market head-on. The SAP market experienced buoyancy probably not seen for more than a decade. As we enter the next year, we can definitely see that 2019 is going to be big for SAP. For SAP practitioners, 2019 will bring numerous opportunities to realize new solutions to discuss the digital transformation requirements of their clients. It will be interesting to see how we take advantage of these. In this post, we will discuss 10 reasons why SAP is being loved by everyone and why it be huge success in the coming year. Let’s first discuss what SAP is. Many companies buy enterprise resource planning (ERP) systems to manage different business processes within the company, including human resources, accounting and purchasing in one integrated system. SAP- an acronym for the German phrase meaning system analysis and program development is a computer program that some companies use for their ERP system; it incorporates features for nearly all business operations. SAP is Suitable for all size of Business: SAP is Suitable for Business of all sizes: Other ERP systems are utilized in the companies with a particular size, but SAP ERP is used in almost all dimensions of the businesses. SAP offers a comprehensive solution with a direct implementation method. Moreover, transitions are smooth with the growth and development of the organization. SAP also gives numerous cloud solutions, and it assimilates with complimentary services, like Google and PayPal. SAP is a Global Solution: SAP is the reputed company in Germany, established in 1972 which is essentially developing ERP software that offers the same integration solution to companies located in various areas all around the globe. These days, more than 50 countries have accepted SAP ERP software solution, and there is no uncertainty that the SAP ERP software solution is continuously gaining approval in maximum countries. 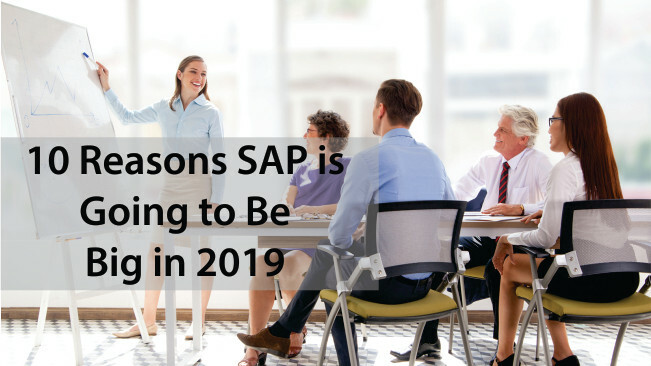 The post 10 Reasons SAP is Going to Be Big in 2019 appeared first on erpinnews.